Thanks to the archive of the town for providing us with the historical photos. The photos on this page can be enlarged by a mouseclick. In the Middle Ages Königslutter was just “Lutter”, meaning “pure, clean” with reference to the clean water of the little river Lutter. 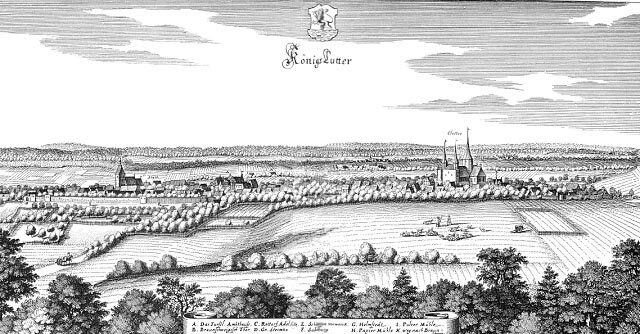 Later it was changed to Königslutter in reminiscence to the king and later the emperor Lothar III., who is buried here. Old documents mention Lutter as early as 1150 but most probably settlement here began several centuries earlier. The market place was an old gathering place around which the people built their houses. Around 1200, the duke of Brunswick built a castle with a moat around it. 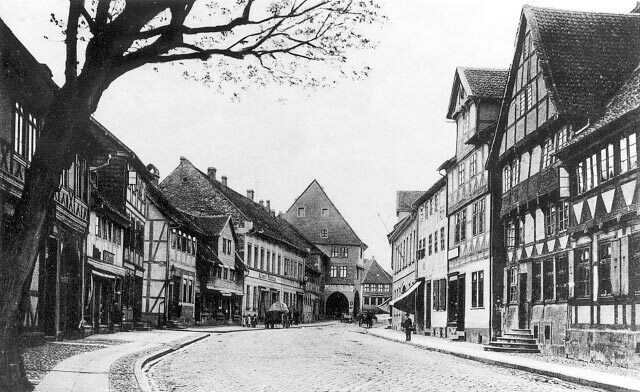 In its shelter, Königslutter soon developed to a market place and with the beginning of the 15th century received the town charter. 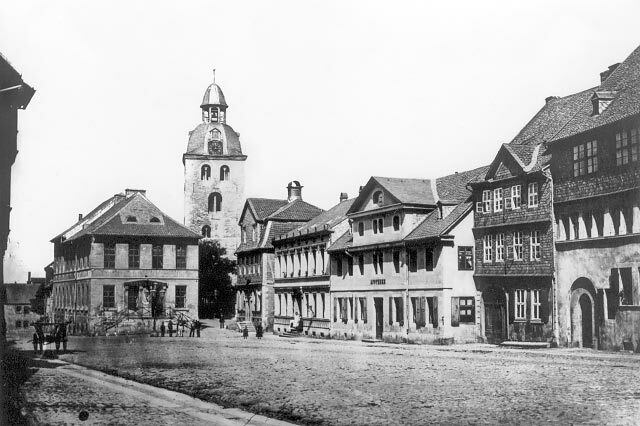 Development of the town was encouraged on account of its situation on the old military and trading route from Aachen to Königsberg. The main trading goods in mediaeval times were limestone from the Elm and cloth. Prosperity came after the 30-year war in form of a brewing tradition with the famous “Duckstein”-beer. There were as many as 73 breweries in the town and the beer was even exported to Leipzig, Berlin, Hamburg and the Netherlands. It was also very much favoured at the Court of King Frederic William 1st. of Prussia. During the 19th century beer-brewing diminished; 1867 mentions 3 remaining brewers and in 1903 the last brewer gave up. In the mean time though a sugar factory had gained importance and during the 20th century, a cannery and the Roto factory making copying machines played an important role. In addition to the town of Königslutter, there was also Upper Lutter (situated between town and the Kaiserdom) which was one of the most underprivileged villages in the duchy of Brunswick. Upper Lutter bordered on to the Lutter Foundation. Since as early as the 11th century it had a monastery next to which Emperor Lothar III. built his foundation church from 1135 onwards. In 1924 Upper Lutter and the Lutter Foundation became part of Königslutter. And in 1974 the town was enlarged by the incorporation of further 17 villages around the town.